I once overheard a personal trainer at my gym say to another trainer “I was so bad today, I had a white bagel!” The other trainer gasped in horror as I cringed to myself and debated whether or not it was worth telling the trainer how silly she sounded. I don’t like when people refer to themselves as bad because of something they ate. That’s classic eating disorder talk and it’s sad to think that some people genuinely feel so guilty about something they ate. Sometimes I think things like the trainer said are said as an exaggeration or for effect, but it’s still not a good habit. Eating a less than healthy food does not make one a bad person! Lying, cheating, stealing…those things make you a bad person, but not your nutrition choices. The problem I see with striving for perfect nutrition is that it doesn’t exist. Think about it: two of the most popular ways of eating out there currently, vegetarianism and Paleo, are just about as opposite as you can get. So how do you even begin to define what “perfect” would look like? There is no consensus on what the best diet is, even amongst nutrition professionals. Another problem with trying to attain perfect nutrition is that there is almost always a next step that could be taken. Eating lean meats isn’t good enough; you have to marinate them to help reduce development of carcinogenic compounds during cooking. Oh and make sure it’s grass fed and free range. And local. Maybe it starts with decreasing sweets, then it’s decreasing refined grains, then it’s all grains, then it’s an eating disorder. Okay, now I’m exaggerating but you know what I mean. Where do you draw the line? To me, this means that trying to reach nutrition perfection will result in inevitable failure, and you’ll end up feeling bad about yourself and possibly set yourself up for disordered eating. So what do you do if health is important to you but you don’t want to feel bad about your nutrition choices? Eliminate food rules. If you have rules, you’re more likely to want to break them and then feel guilty about it afterwards. Practice mindful eating. Pay attention to what you are eating and enjoy it. Find balance. 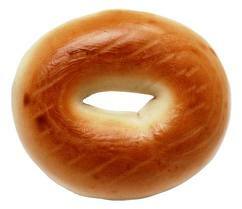 A white bagel isn’t going to ruin your health as long as it’s not the main staple. Set more realistic goals, like choosing whole grains more often than not, that way you don’t have to shame yourself for the occasional appearance of a white bread product. Practice moderation. Allow yourself less nutrient dense foods, such as dessert, on occasion. Totally denying yourself of it will just make you want it more. Reward with food in moderation. But also try to find other forms of reward, like getting a massage or buying yourself that new gadget you’ve been wanting. Never punish with food (yourself or your kids). Even taking away dessert can backfire. I once worked with a patient whose parents locked up all the candy in the house when she was a kid. Years later when she got a car she started driving to the store daily to buy her own candy to binge on. Focus on the positive. Instead of thinking about what you “shouldn’t” eat, focus on getting plenty of nutritious foods. If you’re getting enough of them you just might find you don’t even want the less nutrient dense stuff. Get to the bottom of the bad feeling. Chances are it’s not really about the food, so if you are feeling really guilty about your food or eating habits or your body enlist the help of a dietitian or even a therapist to explore your relationship with food and your body. This entry was posted in Eating Disorders, General Health. Bookmark the permalink.